It was interesting to see how premillennialism as well as inerrancy was an identity issue in the early fundamentalist-evangelical movement. Early FTS, for example, was thoroughly pre-millennial: it was in their statement of faith, and the faculty was sharply divided over a pre-tribulation versus a post-tribulation view of the rapture. Marsden calls this a “leading issue” (151), with Harold Lindsell, Wilbur Smith, Gleason Archer, Carl Henry, Everett Harrison, and Charles Woodbridge lining up for pre-trib versus George Eldon Ladd, Edward John Carnell, Clarence Roddy, and Dan Fuller lining up for post-trib. In that setting, G.E. Ladd’s The Blessed Hope (1956), a case for historical premillennialism, was controversial. Imagine how amillennialism or postmillennialism would have been viewed! Besides providing a bit of historical context for the high degree of importance some churches and denominations attach to premillennialism today, these facts remind me that church politics are never motivated purely by truth considerations. You can’t assume that Christians who line up on paper will get along well together. You have to look at the identity issues; you have to look at the history; you have to look where the battles have been fought. Mark Noll has argued that in a Protestant setting, where there is no Pope or council to hand down authoritative rulings, popular opinion tends to play that authoritative role. While to some extent this may be unavoidable, I think we should be discerning about the way we use theological distinctives in church politics. Truth will always be discriminating, but not every issue deserves to be a litmus test. As with most history books I read, I am struck by the amazing fact of historical contingency. So often things seem to have turned in a dime, and it is so easy to imagine events at FTS going differently. For example, Harold John Ockenga narrowly declined the presidency at FTS on two occasions (the second time very narrowly). Where would FTS be today if Ockenga and not E. J. Carnell had become president in 1954? Its difficult to see the growth of the Paul Jewett-C. Davis Weyerhaeuser-Dan Fuller party under Ockenga’s leadership. Or where would FTS be today if Ockenga had taken charge in 1963 instead of David Hubbard? Again, its difficult to imagine the further drift toward soft evangelicalism in the latter 60’s and 70’s under Ockenga. History is like a river, and so often it seems that the tiniest stone in the path has turned the entire stream into a different direction. 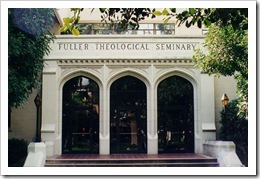 FTS was an institution without particular ecclesiastical or denominational commitments. Unlike Princeton, it was not one ministry among other ministries in a particular denomination. Rather, as Marsden points out (e.g., 275), it was a de novo creation of a few very intelligent and capable individuals, and therefore it was liable to sudden changes when those individuals clashed or left. It lacked the stability that comes from tradition. This makes me wonder about the role of tradition in the church and in para-church institutions. I am Protestant and believe that Scripture should stand above church traditions and critique them. But I wonder if we evangelicals at times have too dismissive and neglectful an attitude toward tradition. In our post-modern setting of isolation and individualism, I believe we as the church must recapture a sense of our historical rootedness. We are part of something that has been going for generations upon generations. It seems to me that there is a lot of power in learning from, and living in light of, that fact.